In trying to use the Blue Aura, I don't have the option to select a sampler mesh. It's just not there. Any thoughts on how to fix that? I mean, this effect is completely useless if you can't select a mesh. So you have to buy the plug in separately just to use what was included with the library? 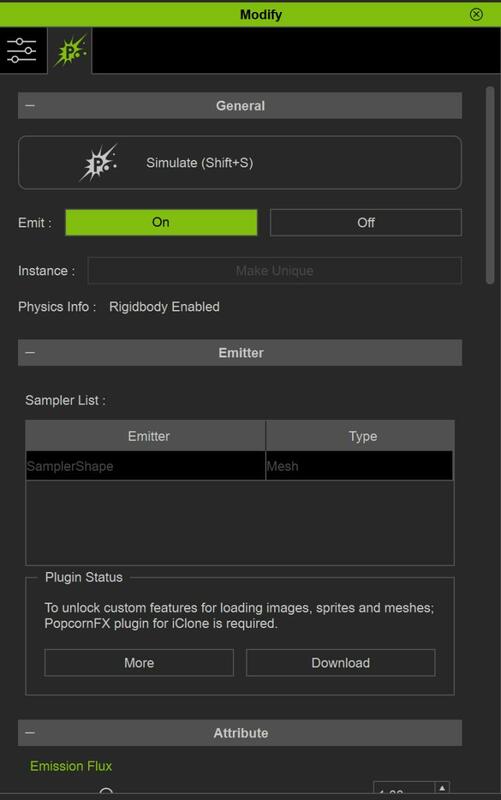 Yes you have to buy the "Popcorn - FX-PlugIn" if you want to work with the "Popcorn FX Library 40" content. Without the "Popcorn FX Plugin" this package is pretty worthless (kien editing capabilities of the included FX plug-ins "
I wish it would've been more clear in the advert that came to my email. The PopcornFX Library 40 is a standalone content pack. It shouldn't be confused with the PopcornFX Plug-in. The PopcornFX Library 40 contains pre-set particle effects which are fully usable and are not demo or trial versions. However, if you wish to customise the particles included in the pack then you will need the PopcornFX Plug-in.